Robert Housen, the winner of six New Jersey State Golf Association Amateur Championships, is known as one of the finest amateurs in the history of the state. He is long-time member of Manasquan River Golf Club and is a former captain and record 24-time member of the NJSGA’s Compher Cup teams, a seven-time winner of the State Pre-Senior and two-time champion of the State Senior Open. 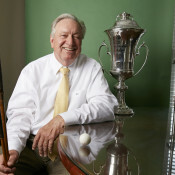 Housen is a two-time Met Senior Amateur champion and also won the Legends Division (70-plus) of the Met Senior Amateur. In 2010, he won the Super Seniors Division of the NJSGA Senior Amateur. Housen also has the distinction of having won the Father & Son Championship with his father, Donald (four times) and his son Chris (once).